Friday Find: Look Who We “FOUND”! Look who we found on island, Chris O’Reilly and his fellow North Bennet Street School (NBSS), Preservation Carpentry classmates! For those who are not aware, O’Reilly is our first full-time scholarship recipient and is currently underway in his second, and final year attending the NBSS’s Preservation Carpentry program in Boston’s North End. Recently he returned home to the island with his classmates for a two-week stay and worked on two historic properties. The Nantucket Cottage Hospital Thrift Shop located at 17 India Street (NPT easement property) received a grant from the CPC to restore the building’s fabric. 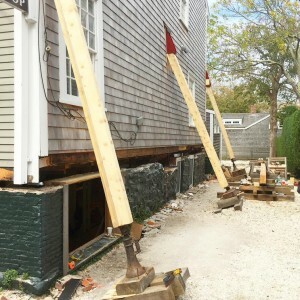 O’Reilly and his fellow classmates were able to partake in this restoration process by making plumb one side of the building’s wall, which had buckled. 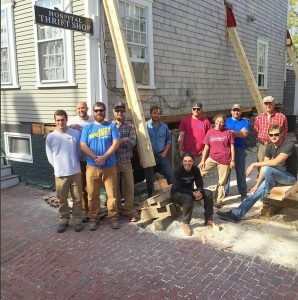 The group was also able to work on their timber framing skills at 12 Liberty Street or better known as the Macy-Christian House, owned by the Nantucket Historical Association. Learn more about our scholarship program by clicking here and to learn more about the NBSS, Preservation Carpentry program click here.